The evolution of Vedic symbols is a prehistoric knowledge and does not fall within the intellectual preview of western Indology. It is the measureless knowledge of an occult Light transforming itself into word and symbol; it contains the sense of the universe and beyond but as a direct knowledge of its inherent Truth-Consciousness. It is not only the undifferentiated One in the Many, it is also the Many in the One as the supreme Creatrix of the transcendent Mother. In the Vedic terminology, it is the मङ्गलम् (Maṅgalam) of a supreme Consciousness as the symbol and word manifesting in the mind of the Rishi, the embodied being of illumination in the physical. He is more of a Tantric than a Manomaya Purusha, for the knowledge of the Truth rendered to him in high symbols often translates or self-effectuates in the physical as the sacred law of the Divine. The Rishi is also the hearer of the Truth, the vanguard of the descending श्रुति (Śruti), the harbinger of the highest. Śruti, in this context, is the power of the Spirit moving between the dynamic ranges of the Divine Consciousness at will and bringing the beauty of the divine symbol into the chisel of the artisan and the illumined mind of the seer. But all word and symbol of a higher Gnosis is crafted by the all-creative Knowledge of the Mahasaraswati in her absolute wisdom and creative impulse. She is the master-Craftswoman of the luminous heavens and manifest here in every symbol and word of the Rishi. It is out of her infinite prowess and its perfect expression that the sense of the Veda could be deciphered and rightfully interpreted. The self-decaying urge of humanity towards an easy substitute in place of the complex Vedic symbol and word has created a retarded sense of the Vedic idea and turned the native truth-sense of the Riks into an elementary ritual of the philistine and the wayward. I believe that it is the duty of the author to reinvent or more properly, rediscover the true sense of the Riks by dwelling into the esoteric mystery of the Vedic texts and posit a practical framework in which all errors of mental knowledge are eschewed and the hidden sense restored. It is in this context that we require the grace of Mahasaraswati as well as the power of her divine intuition to aid our effort and its eventual fulfilment. A prehistoric knowledge such as the knowledge of the Vedic era cannot be traced through external records of history; it lies deeply buried in the heart of the individual as a thousand-petaled Lotus but remains withdrawn in the quiescence of the hidden Self and will blossom only when it is touched by the rays of the divineसूर्य (Surya) above the immortal ether of the Gods. 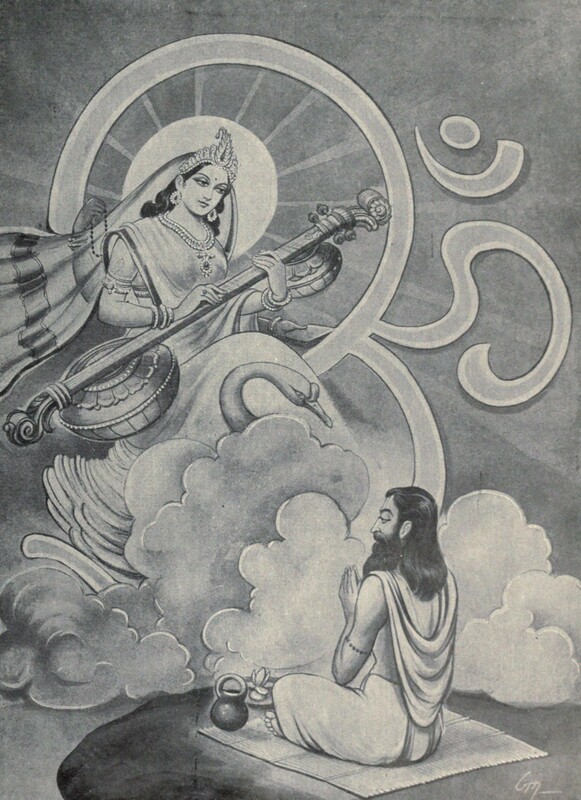 Mahasaraswati receives the higher light of the Divine Gnosis into herself first and then weaves the symbol and structure out of that original synthesis for the mankind to follow and prosper, but it is only when humanity seeks the Divine for His own sake that the secret of existence, of which the Veda itself is a symbol, can be utterly known and lived in the self as well as in the body. If the body of a higher occult knowledge such as the Veda is to be realised as a natural expression of a manifest life here, not merely as an added prerogative of a far-off Spirit, then it is here in the realm of physical matter that the attempt must be rigorously pursued and accomplished. And, if it is to be established as a law of the Spirit here in the terrestrial, the importance of which is immense to mankind, then it is to be attempted first by the rigour of a few individuals who have seen in themselves the native light of the highest Sun. The implications of this effort are far-reaching and imply a paradigm shift in the very composition of the being in the shackles of lower Nature and her limited and binding laws. For the in the realisation of the Vedic symbol and word lies our complex and consequent ascent into the integral Spirit and its descent into our dark matter. Mahasaraswati captures this integral sense in the mind of the seeker in the form of a higher intuitive perception, a heightened capacity and cognitive ability independent of the human brainbox, a wideness and a freeness in thought which no longer is subjected to the vagaries of the self-demanding vital, and out of this self-ascent into the immediate borders of a higher mental light comes the essential understanding of the Vedic symbol and word. But the essential and inevitable development of Śruti and the sureness of its direct spiritual perception comes from the spiritual Consciousness above the higher mental, and it is out of this spiritual Consciousness emerges the living Deity behind occult symbol and word and the happy realisation of Him in the heart and mind of the seeker as the primal Force or Creatrix of this evolutionary marvel. Though this higher consciousness is infinitely wide and boundless, it is still an expression of the dynamic Light still above, and as such, cannot wholly bring into its possibilities the highest realisations of the Supreme here. It is still a barefoot of the Divine measuring the world and the universe in the measureless amplitude of its infinite Consciousness, but the Divine Gnosis is the heart of the Supreme in which resides the countless universes and their nebulae, the origins of the Gods and Veda and the highest Symbol and the most complex word. Mahasaraswati carries the Śruti or the word of the Divine Gnosis into the spiritual and lower planes, and in the physical, though it is difficult and laborious, she is constantly perfecting it through the skill and labour of her endeared instruments, but the crude eye of material intelligence sees only the artistic beauty and aesthetic appeal of the symbol and transmogrifies the spiritual and the divine into the term of its intellectual aberration, which it confidently calls the last word on the mystery of God. The law of the governing principle of life is still in the clutches of a crude and powerful material Negation. As there is an involved Divine Consciousness here, so there is also an involved Nescience, which despises the Light and Consciousness of the supreme Gnosis and resists all urge and movement towards progress and self-being, and where it could not hold or prevent the emergence of the hidden light and splendour of the evolving Consciousness, it erects resistances insurmountable in scope and nature, often circumvents the evolutionary possibilities to a slow, grinding process of self-retardation and plunges the being in the unprogressive inertia, characteristic of the terrestrial. The power of divine Śruti is not likely to descend into these conditions as into the minds of unprepared souls, unless the conditions are perfect enough for a safer descent and larger synthetic workings. It is in these apparent conditions of negation that we have to aspire for the grace and illumination of the Mahasaraswati-Force into our being and so implore her to perfect our sense of occult hearing of the divine Word to manifest out of it a greater and more potent symbol of the highest Godhead and His immeasurable swiftness of being and spontaneity of self in this dark terrestrial existence. That is the purpose of the divine symbol and word of the Veda in the terrestrial, and also, of the tantric. The sense of the Veda has been built around this practical utility towards a greater progress of the immanent Spirit here by the help of the all-pervading Spirit from above. The senseless preoccupation of the western Indologists with the hard outer shell of the Riks, which is only an encrypted key to their high secrets and extraordinary illuminations, arises out of its natural inability to see through the outward symbolism the inner wisdom of the ancient Masters, the Hearers and Manifestors of the Divine Śruti, the Perfectors of the secret Fire and the timeless Sun. It is not in the nature of the western mind to seek through the inner its outward premiss and foundation of being and the sense of its collective civilisation; it rather seeks through the outward and dim peripheries its life-impulse and life-sustenance and always ends up under the unholy rule of a dark, incomprehensible Machinery which masquerades as a dominant symbol of mankind’s search for a stable truth and less painful life. This inverse or rather perverse method of inference of the Vedic Riks by the Indologists without an inner basis or even a semblance of it must be opposed with a newer arguments and forceful logic arising out of a spiritual mind free from the taints of mortal ignorance, documented clearly and propagated with an undying zeal of a Kshatriya in the midst of his greatest battle. This is the purpose for which a few of us have risen from the common brood and this is the purpose for which the infinite Mother has given her divine sanction. Founder @goldenlatitude. Lover of Sanskrit and the English Metre. Mostly write on Sri Aurobindo’s Yoga, whom I earnestly follow within and without. Kali’s Brood is an earnest attempt at reviving the sense of Yoga as understood & practised by the Vedic Seers, and in the modern times by Sri Aurobindo, and through that the manifestation of the Divine potentialities in all of us.